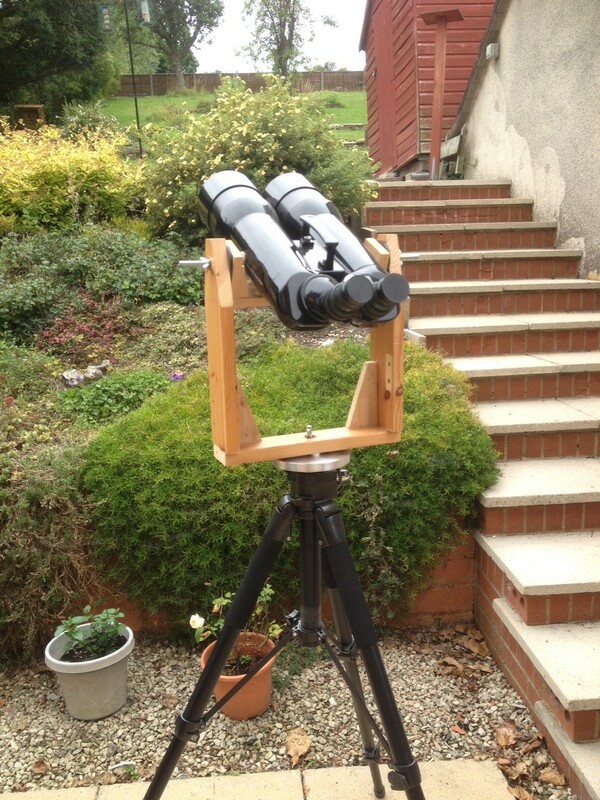 I have finished knocking up a simple altazimuth mount for the 100mm APM binoculars that sits on top of heavy duty camera tripod. The mount was knocked up in an afternoon from scrap wood around the garage. It is meant to be a prototype to see if I have the dimensions correct before making a smarter looking version. To my surprise, it works very effectively and will probably end up in service for longer than I originally planned. 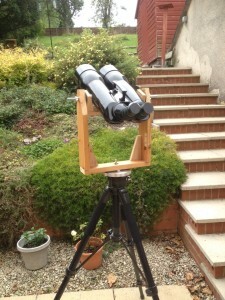 It was used in anger at Andover Astronomy Society’s Perseid Star-BQ on Saturday 15 August. It performed admirably giving excellent views across the night sky – including tracking a space station pass. The binoculars were raised and lowered for a number of observers ranging from >6’ tall to just over 5’ as we observed objects that were just rising to those overhead at the zenith.